I love pareidolia. You skeptics out there already know what that is. For the benefit of the pre or non-skeptic, pareidolia is the human ability to recognise patterns or pictures in random information. 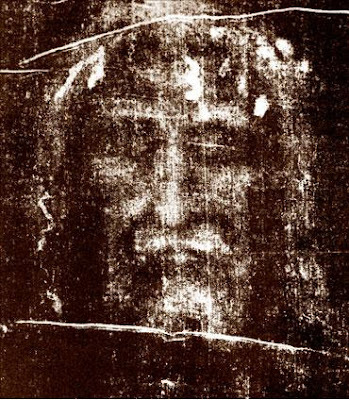 The Turin Shroud image is a photographic negative, since the Catholic/deluded believers think he looks more believeable and worshippable that way. I agree, assuming it is not Photoshop'd (Annie thinks it is), that it is a pretty good match, even is if it IS missing the blood splatters. 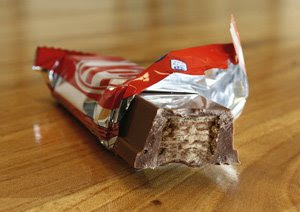 I picked a Turin Shroud picture already tinted a nice dark brown so as to match the Kit Kat better. Proof positive of the Divine Influence of GOD on a chokkie bar!!! Yowza!!! The Shroud of Turin has been pretty conclusively debunked. It is a medieval fake. Unless, of course, you are a credulous member of the aforementioned Catholic/deluded faith. So, God has chosen to create the image of a forgery of the image of Jesus, in a chocolate bar. If so, he is displaying a rarely obvious sense of humour here. It would seem that The Lord is confused about what he really looked like on his brief stop-over in human history. 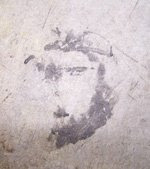 This is a slab of concrete with an oil stain on it. Its owner managed to extract over $1500 off some religious idiot for it. To put it another way, if God was REALLY planting happy-snaps of himself in and around our planet, you would think he would keep the image vaguely consistent. These things always have beards (the Jesus ones, not the Virgin Mary!). Beyond that the resemblances are pretty thin. 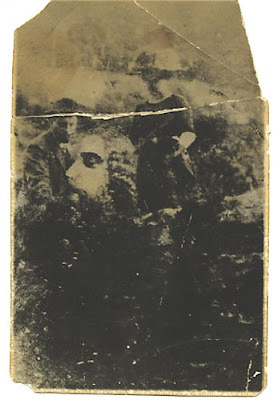 Is this yet another Jesus revealing himself in a mysterious way, or a baby in a bonnet sitting on daddy's knee?